Definition - What does Parivrtta Parsvakonasana mean? Parivrtta parsvakonasana refers to a variation of the standing side-stretch yoga asanas that require balance and flexibility with the legs in virabhadrasana lunge position; the opposite arm rests on the lead leg or reaches to the ground, while the other arm extends overhead, creating a twist through the core of the body. In addition to its physical benefits, this pose is believed to relieve stress. The name comes from the Sanskrit parivrtta, meaning “to turn around” or “revolve,” parsva, meaning "side or flank," kona, meaning "angle," and asana, meaning "posture." The common English name for parivrtta parsvakonasana is revolved side angle pose. 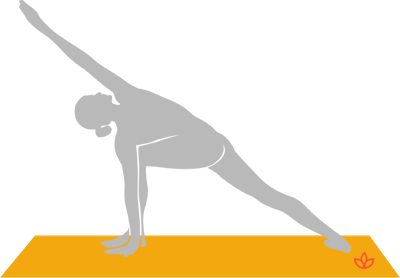 Traditionally, parivrtta parsvakonasana is believed to activate the manipura chakra. This chakra is the body's energy and vitality center, transporting confidence, internal strength and courage. By activating this chakra, parivrtta parsvakonasana is thought to dispel fear and insecurity. Parivrtta parsvakonasana is part of the primary series of Ashtanga yoga and a key pose in other styles of yoga. A related asana is utthita parsvakonasana (extended side angle pose) in which the lead arm rests on the bent leg or reaches toward the ground and the trail arm stretches overhead. Parivrtta parsvakonasana is also similar to parivrtta trikonasana (revolved triangle pose), except that the latter is practiced with both legs straight.